100 million years. They are now in imminent danger of extinction. Also known in English as Leathery, Luth or Trunkback, this turtle is more commonly referred to around the world as theLeatherback Turtle (Dermochelys coriacea). Its name is derived from the Greek words dermos – skin, chelys – turtle and coriacea from the Latin corium – leather, which describes the unique black leathery/rubber like carapace. The carapace is curved and has seven prominent longitudinal ridges tapering to a point at the rear. The Leatherback is the sole member in the family Dermochelyidae and does not have the familiar bony plate structure common to other marine turtles in the family Cheloniidae. Leatherback’s have existed in the earth’s oceans for over 100 million years and evolved more than 65 million years earlier than the other six surviving species of marine turtles which all belong to the family Cheloniidae (Dutton et al 1999). It is the largest of the turtle species living in marine waters, with most adults growing between 1.2 and 1.7 metres (curved carapace length) and weighing 300-600 kg. Front flippers are proportionally long in comparison to the body, at least half the carapace length and limbs are clawless. Records of this species in Victoria have declined in recent years. Between 2012 and 2017 there have only been 7 records in Victoria. Leatherback Turtles have worldwide distribution and are found in tropical, temperate and sub polar waters in all oceans of the world. They migrate vast distances following warm water currents between tropical nesting sites and temperate water feeding areas. In Australia, most sightings are from temperate waters and in Victoria most sightings occur between January and May when sea surface temperatures can range between 15° to 21° in northern Bass Strait. Sightings in April and May account for nearly 50% of Victorian records. 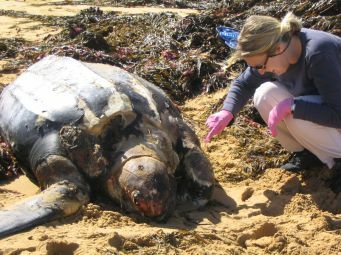 Bass Strait is now considered to be one of the three largest concentrations of feeding Leatherbacks in Australia, others being central and southern New South Wales and across the Great Australian Bight (C. Limpus pers. comm). Leatherback Turtles feed mainly on pelagic invertebrates, jellyfish being the most widely recorded food item. They are capable of undertaking long migratory journeys and their pattern of movement can follow a straight course for hundreds or thousands of kilometres over open ocean. Juveniles less than 100cm are limited to tropical waters in excess of 26° and stay near the coastline. Whilst adult males never leave the water, females return to the same tropical nesting areas where they lay eggs on sandy beaches with open access to deep water (IUCN 2003). Within the wider Pacific basin major nesting areas are Mexico and the Central American coast of Costa Rica and Panama (Spotila et al 1996). The island chain to the north of the Coral Sea is likely to be the origin of most Leatherback Turtles visiting Australian waters (Limpus & McLachlan 1990). These include Java, the north coast of Papua Guinea and Irian Jaya, where nests can be in the hundreds or more. Other low-density nests are dispersed through the Solomon Islands, Fiji and in Australia along the coast of Arnham Land. Worldwide population estimates are based on the number of females nesting on 28 beaches selected throughout the world where Leatherbacks are known to repeatedly nest. There has been a dramatic decline from 115,000 nesting females in 1980 to 34,500 in 1995 (Spotila et al 1996 & 2000). The most severe decline has been within the Pacific where the nesting population has plummeted from 91,000 in 1980 to less than 5,000 in 2002. The Pacific Leatherback Turtle has shown a 95% decline throughout its range in the last 22 years and a number of leading research scientists consider Leatherbacks to be in imminent danger of extinction (Leatherback survival conference 2002). Within the last 25 years there has been an extinction of nesting Leatherbacks in eastern Australia and former nesting in areas such as the Bundaberg area of southern Queensland is no longer considered viable (C. Limpus pers. comm). Reduced nesting success in neighbouring countries through harvest of eggs for food and coastal developments which increases disturbance on nesting beaches and threatens the viability of nesting populations. Entanglement and fisheries by-catch are reported throughout the world with the vast majority of records involving monofilement longline, lost pots, rope, trawl and gillnet mesh (Laist 1997). The highest risk for Leatherbacks in Bass Strait appears to be entanglement in crayfish pot float lines. Dead beach-washed specimens are sometimes found along the Victorian coastline in varying state of condition with a possibility that some are attributable to a human cause. Ingestion of marine debris particularly plastic bags which are mistaken for prey such as jellyfish. Plastics account for a high proportion of marine litter. In Bass Strait as the distance from population centres increases the proportion and relative abundance of debris is clearly attributable to shipping and off-shore fishing activities with the highest density of litter occurring in waters west of Wilsons Promontory (Gregory & Ryan 1997). Marine noise from shipping, seismic surveys, drilling, blasting etc. could influence behavioural change when migrating or feeding. With the species in such sharp decline any loss is of concern; estimates for population survival in the Western Pacific are that anthropogenic mortality from all causes should not exceed 18 adult females per year (Spotila et al 2000). 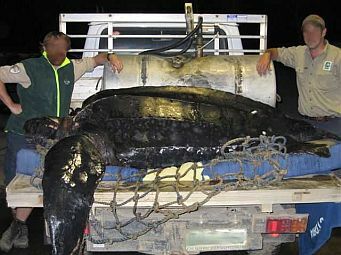 The Leatherback Turtle was listed under the Victorian Flora & Fauna Guarantee Act 1988 in 2002 (SAC 2002). A Flora Fauna Guarantee Action Statement No. 250 was prepared in 2009. This includes measures to respond to entanglements, improve collection of data and implement management actions that will aid in protection of Leatherbacks whilst in Victorian waters. Continued collaboration between scientists working on the Leatherback Turtle both within Australia and overseas will ensure a more global perspective on protection and recovery of this species. Leatherback Turtle found washed up dead at Stony Point (Western Port Bay), 1 March 2017. Cause of death unknown. Note hind right flipper missing which could have been from shark bite (before or after death) or propeller damage. Image courtesy Abby Smith, DELWP. Leatherback Turtle found washed up dead on the beach at Yambuk 14 March 2017. Image courtesy Anthony Carroll. Note damage to left front flipper area. Laist, D.W., (1997) Impacts of marine debris: entanglement of marine life in marine debris including a comprehensive list of species with entanglement and ingestion records. In Marine Debris: Sources, Impacts and Solutions. Eds J.M. Coe and D.B. Rodgers, pp99-139. Springer-Verlag, New York. Gregory, M.R., & Ryan, P.G., (1997) Pelagic plastics and other seaborne persistent synthetic debris- a review of Southern Hemisphere perspectives. In Marine Debris: Sources, Impacts and Solutions. Eds J.M. Coe and D.B. Rodgers, pp 49-66. Springer-Verlag, New York. Limpus, C.J. personal comments, (2004). Queensland Environment Protection Agency. Limpus, C.J. & McLauchlan, N.C. (1990) The conservation Status of the Leatherback Turtle, Dermochelys coriacea, in Australia. 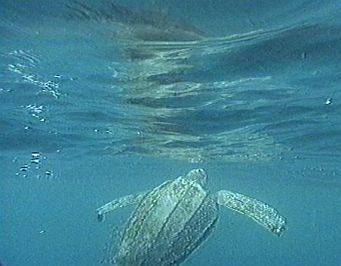 Proceedings of the Australian Marine Turtle Conservation Workshop, pp 62-66, November 1990. Australian Nature Conservation Agency and Queensland Department of Environment & Heritage. Spotila, J.R., Dunham, A.E., Leslie, A.J., Steyermark, A.C., Plotkin, P.T., Paladino, F.V. (1996) Worldwide Population Decline of Dermochelys coriacea: Are Leatherbacks going extinct? Chelonian Conservation and Biology. No.2, 209-222. Spotila, J.R., Reina, R.D., Steyermark, A.C., Plotkin, P.T., Paladino, F.V. 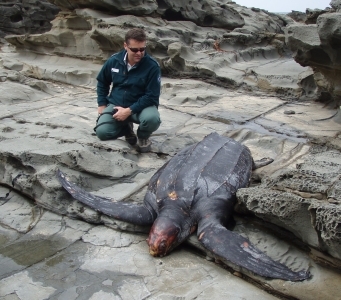 (2000) Pacific leatherback turtles face extinction, Brief communication, Nature (vol. 405) 1 June 2000.